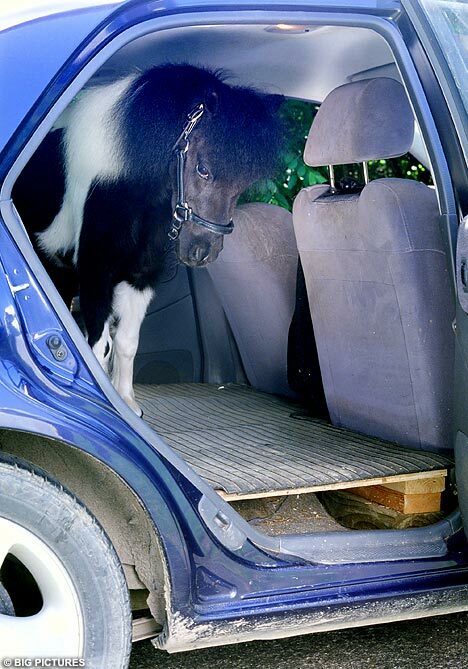 Only two commands are left to be discussed from the learning list for guide animals – and since the information on the training of minis was so minimal and I had to go by the book which is about guide DOGS, I am not even sure that the next command applies to horses at all. The command “follow!” is used for guide dogs in situations, where a blind person becomes totally disorientated and needs help from another human. This situation might arise for example in a large crowd in a big shopping mall – and when the blind person has lost his bearing, he is not able to give helpful commands to the dog any longer. He would then ask another person for help, who would become a “designated guide” as long as the blind person wants to follow him. The dog gets the command “follow!” and knows who is meant, because his partner keeps up a running conversation with this designated guide for as long as his assistance is needed. This way the helper doesn’t have to touch either the blind person, nor, of course, his dog. I have no idea whether the same can be achieved with mini horses, as there are no anecdotes in the literature, which I could find. So we have to leave it at that. But the next point is in my opinion the most interesting of them all and lead me into this excursion into guide animals in the first place. How do they learn to decide when NOT to obey a command, because it would compromise the safety of the situation? We learned before that a guide animal ONLY moves on command and that all commands are always enforced. So disobedience is only acceptable for the sake of safety! 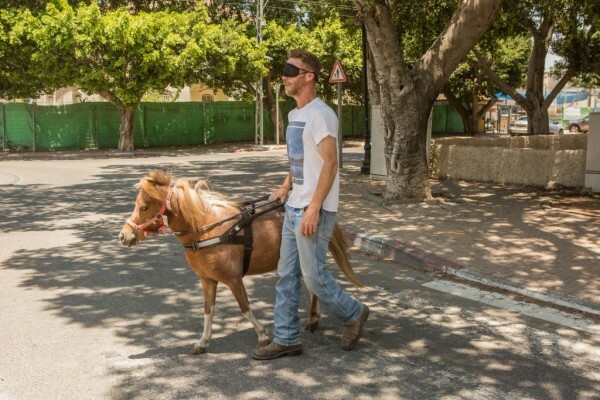 For ex: the blind handler gives the command “forward!” when the traffic just started moving – and the guide animal has to understand that it is to be obeyed ONLY when the conditions are right! It is up to the guide to ascertain that – it is a question of survival! If an animal in advanced training doesn’t get that twist – he must be rejected as guide animal. The guide dog books I read tell that the first exercises are staged – like a true near-accident. 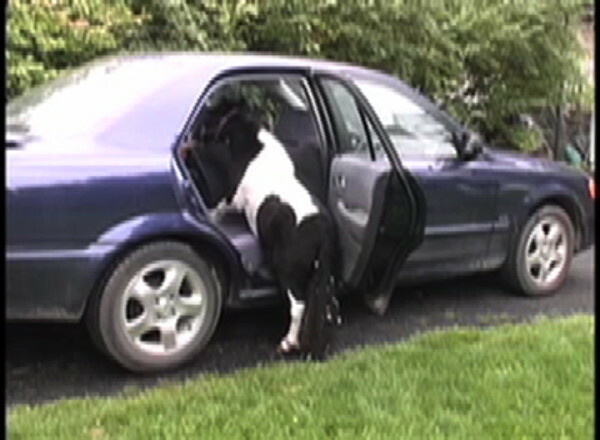 A car is coming to a screeching halt up close to the dog and trainer – they try to shock the animal and come to a rigid stop. The trainer will then bang on car – say “NO!” – and make it dramatic enough to be memorable. They also stage near accidents with cars speeding by too closely. So we see that intelligent disobedience mostly comes into play with moving obstacles are coming toward the blind handler, such as cars, bikes, and pedestrians, – and usually at crossings. The guide animal, whether mini or dog, must anticipate the changing conditions and rely on its best judgement. It surely helps to establish routines during training and experience is the key. Situations will be repeated and great praise will reinforce correct reactions from the trainee. I must admit that I am glad that I don’t have to rely on Beau’s decisions with my life! In advanced training the instructor will “play blind” and venture with his trainee blind-folded into the real world with real traffic. Nun bleiben nur noch zwei Kommandos auf der Lern-Liste für Führtiere – und da die Information über das Training von Führ-Minis so minimal war, mußte ich wieder auf die Bücher über BlindenHUNDE zurückgreifen, und bin mir nicht mal sicher, ob das nächste Kommando auf Minis zutrifft. Dieses Kommando (das auf deutsch eventuell anders heißt) wird bei Blindenhunden in Situationen angewendet, in denen der Blinde ganz und gar die Orientierung verloren hat und Hilfe von einem anderen Menschen braucht. Zum Beispiel, wenn er in einer Menschenmenge in einem großen Einkaufszentrum die Richtung verloren hat – und wenn das der Fall ist, kann der Blinde auch seinem Hund keine hilfreichen Kommandos mehr erteilen. Er würde nun einen Menschen um Hilde bitten, der dann der „designierte Führer“ ist, solange der Blinde ihm folgen will. Der Hund bekommt das Kommando „Folg Dem!“ und weiß, wer gemeint ist, da sein Partner einen ständigen Dialog mit diesem unterhält, solange dessen Hilfe gebraucht wird. So muß der Helfer weder den Blinden noch dessen Hund berühren. Ich habe keine Ahnung, ob das mit den Minis auch möglich ist, da ich solche Anekdoten in der Literatur nicht finden konnte. So belasse ich es dabei. Aber der nächste Punkt ist meiner Ansicht nach der interessanteste von allen und eigentlich das, was mich zuerst in das ganze Thema der Führponys gezogen hat. Wie lernen sie einem Kommando NICHT zu gehorchen, wenn es die Sicherheit der Situation kompromittieren würde? Wir haben schon erfahren, daß ein Führtier sich NUR auf Befehl bewegt und daß alle Kommandos durchgesetzt werden. Ungehorsam wird nur der Sicherheit wegen akzeptiert! Z.B. : der Blinde gibt das Kommando „Vorwärts!“ gerade, wenn die Autos wieder anfahren – und der Führer muß verstehen, daß er das Kommando nur befolgen darf, wenn die Bedingungen passend sind! Es liegt beim Führtier sich davon zu überzeugen – das ist eine Frage des Überlebens! Wenn ein Tier in der Ausbildung diesen Dreh nicht kapiert, muß es als Führtier ausgemustert werden. Das Blindenhunde-Buch erzählt, wie die ersten Übungen inszeniert werden – wie echte Fast-Unfälle. Ein Auto hält mit kreischenden Bremsen genau vor Hund und Ausbilder – sie versuchen das Tier zu schockieren und halten abrupt an. Der Trainer haut dann knallend auf die Motorhaube und sagt „Nein! !“ – und macht es generell so dramatisch, daß der Hund es so schnell nicht vergißt. Sie inszenieren auch Fast-Unfälle mit Autos, die zu nah an ihnen vorbei rasen. Wir sehen also, daß intelligenter Ungehorsam hauptsächlich ins Spiel kommt, wenn sich bewegende Hindernisse auf den Blinden zukommen wie Autos, Fahrräder, und Fußgänger – und das oft an Kreuzungen. Das Führtier, ob Mini oder Hund, muß diese sich verändernden Bedingungen voraussehen und sich dann auf sein eignes Urteil verlassen. Sicher hilft es in der Ausbildung eine gewisse Routine einzuhalten und Erfahrung ist der Schlüssel. Situationen werden wiederholt und großes Lob bestärkt jede richtige Reaktion des Lehrlings. Ich gebe zu, daß ich froh bin, nicht mit meinem Leben von Beaus Entscheidungen abzuhängen! In forgeschrittenem Training spielt der Ausbilder blind und wagt sich mit seinem Lehrling mit verbundenen Augen in die reale Welt mit echtem Verkehr. The trainer finally tests his trainee in real traffic – though I don’t understand why he is on the wrong side of his guide in this picture. Der Ausbilder testet sinen Lherling zuletzt in richtigem Verkehr – nur daß ich nicht verstehe, warum er in diesem Foto auf der falschen Seite seines Führers ist. What I have not mentioned so far, because it goes without saying, is that a guide mini has to learn to trailer load easily – and into any kind of vehicle: cars, buses, subways, elevators and even airplanes. Bisher haben wir nicht erwähnt, daß ein Blinden-Mini sich selbstverständlich problemlos verladen lassen muß – in jegliches Fahrzeug: Auto, Bus, U-Bahn, Lifte und sogar Flugzeuge. The Mini Panda loads himself. Das Mini Panda verlädt sich selbst! Experienced horse people do that with the advance-and-retreat method. This is not so astonishing to us, after all, they fly show horses all over the place constantly. Trust in the trainer is of course the key. Erfahrene Ausbilder machen das mit der Methode von Annäherung-und-Rückzug. Das erstaunt uns alles nicht, denn sie fliegen ja Turnierpferde dauernd durch die Weltgeschichte. Hier ist natürlich das Vertrauen in den Trainer das Ausschlaggebende. 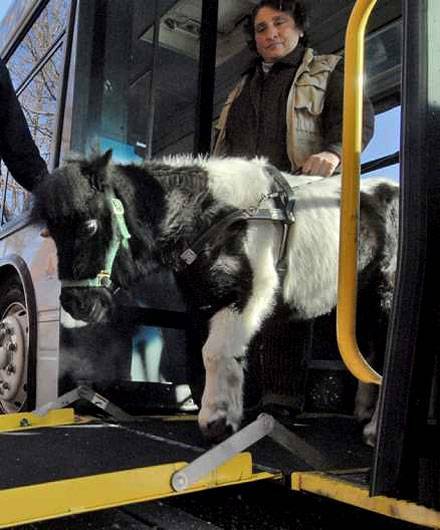 Getting on and off the bus via a ramp is easy. In Busse mittels einer Rampe ein- und auszusteigen ist einfach. 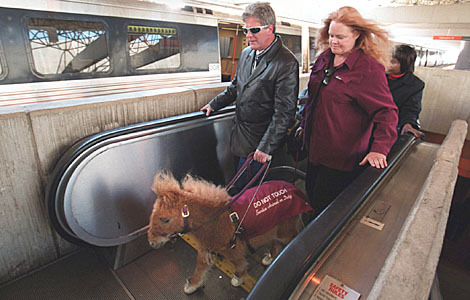 Cuddles leads Dan off the escalator – stepping onto and off moving surfaces is especially difficult. Cuddles führt Dan auf der Rolltreppe. Auf sich bewegenden Untergrund zu treten ist besonders schwierig. We now know that horses can learn an incredible array of tasks and commands – way more than we ordinarily give them in our daily dealings with them. To make our lives more interesting, I think we should all challenge them more! Of course you cannot ever ask your horse to perform something he hasn’t previously learned – and preferably learned with YOU – and teaching him should be fun for you! For my life I will never understand, why people always say they can’t find the time for it… to tickle out of my horse what he just MIGHT be able to understand is the funnest part of our life! Isn’t common interests the best part of any partnership? Nun wissen wir, daß Pferde eine Unmenge von Aufgaben und Kommandos erlernen können – viel mehr als wir ihnen im Alltagsleben normalerweise geben. Ich denke, daß wir alle, um unser Leben interessanter zu gestalten, sie öfter herausfordern sollten! Natürlich können wir nichts von unserem Pferd verlangen, was es nicht vorher gelernt hat – und vorzugsweise mit IHNEN gelernt hat – und ihm etwas beizubringen sollte für Sie Spaß sein! Um mein Leben werde ich nie verstehen, warum Reiter immer sagen, daß sie dazu keine Zeit fänden… aus meinen Pferden herauszukitzeln, was sie vielleicht NOCH kapieren könnten, ist doch der schönste Teil unseres Lebens! Sind gemeinsame Interessen nicht der beste Teil jeder Partnerschaft? 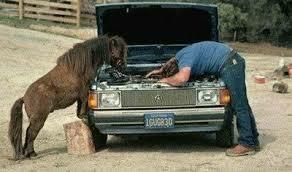 We are very lucky in that the horse is so willing to our often strange ideas of what he should do for or with us. We can even over-ride many of his natural instincts by teaching new associations. We looked at the various processes by which the horse learns, such as habituation, association, latent learning, and imprinting. The most effective way of training horses is by the CUE – RESPONSE – REINFORCEMENT method – also called “shaping” a behavior. This way you can teach a horse anything, which is physically possible. We have learned that punishment is NOT a learning tool, but rather a very good way to de-motivate your horse completely. Training sessions should be kept short and varied so that the horse has time to digest what he has learnt. So as soon as the horse has responded correctly to a request, the session should end on that high note, so that he remembers his feeling of success and will be happy to try again in the next training session. So use your Christmas holiday to make your horse happy by teaching him a new game with all your newly acquired knowledge! Variety and interest is the spice of life. Playing with your horse does not mean that you have to give up riding!! You can play for 10 minutes as warm-up or cool-down before or after – and if you don’t want to be lead like a blind person and lack ideas of what other games might interest your horse, get the book “From Leading to Liberty – 100 training games your horse will love to play”. I play those games with all horses I lay hands on – I know they all love it! And with all this in mind, I wish to all of you and all your horses from my heart a very Merry Christmas and a Happy New Year !!! Es ist so schön, daß Pferde so willig bei unseren oft seltsamen Ideen mitmachen. Wir können uns sogar über ihre natürlichen Instinkte hinwegsetzen, indem wir ihnen neue Assoziationen beibringen. Wir haben die verschiedenen Prozesse beleuchtet durch die ein Pferd lernt, wie Gewöhnung, Assoziation, latentes Lernen, und Prägung. Die effektivste Art des Trainings ist die Methode des– STIMULUS – REAKTION – BESTÄRKUNG, auch „Formen“ eines Verhaltens genannt. Auf die Art kann man einem Pferd alles beibringen, was ihm körperlich möglich ist. Wir haben gelernt, daß Strafe KEIN Lern-Werkzeug ist, sondern eher eine sehr gute Methode sein Pferd total zu de-motivieren. Übungsstunden sollten kurz und variiert sein, so daß das Pferd Zeit hat, das eben Gelernte zu verdauen. Sobald es auf eine Aufforderung richtig reagiert hat, sollte man die Trainingseinheit auf diesem Höhepunkt beenden, so daß es das Erfolgsgefühl abspeichert und beim nächsten Training glücklich wieder dabei ist. Nutzen Sie also Ihre Weihnachtsferien dazu mit all dem neuen Wissen Ihr Pferd mit einem neuen Spiel zu beglücken! Abwechslung und Interesse sind die Würze des Lebens. Mit Ihrem Pferd spielen heißt ja nicht, daß Sie das Reiten aufgeben sollen! 10 Minuten in der Aufwärm- oder in der Auskühlphase hinterher genügen – und wenn Sie nicht als Blinder geführt werden wollen und es Ihnen an Ideen für nette Spiele fehlt, dann kaufen Sie das Buch “From Leading to Liberty – 100 training games your horse will love to play”. (ganz leichtes Englisch und viele Zeichnungen!) Ich spiele sie mit allen Pferden, die ich in die Hand bekomme – und ich weiß, sie mögen es alle! Und mit all dem im Sinn wünsche ich Ihnen und all Ihren Pferden von ganzem Herzen Fröhliche Weihnachten und ein Glückliches Neues Jahr !!! This entry was posted in Horse IQ and tagged horse training intelligent disobedience, Pferdetraining intelligenter Ungehorsam. Bookmark the permalink.